Design your idea. Knit your design. KnitBird is no longer being sold due to other projects that occupy our minds and time. Now you can download KnitBird for free. While you are here, check out the wonderful things that Lilý is currently working on. KnitBird is a software for designing knitting charts. It offers a variety of tools to make it easier for you to put your ideas in a chart, and then to make it real in your knitwear. 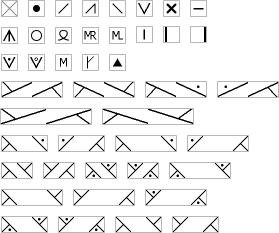 KnitBird includes most of the common symbols used in knitting charts. We are always willing to extent our list of symbols and if you feel something essential is missing, please let us know. PC or a Mac? It doesn't matter. KnitBird is built on the Adobe AIR platform and runs on both Windows and Mac computers. Tool for creating dotted and dashed lines. Move, rotate and flip selected parts of your chart. Easily create repeated pattern from a selection. Color picker for your stitches. Add instructions for your chart and the colors and symbols that you use in your design. Export chart as a JPEG image or a PDF file. Import image files and convert them to a chart design. Insert text into your chart. Easily change colors in your chart. Put bits of your design into a library. You can then later access them to use in other charts. What to see it in action? Try it, see how it works. KnitBird can be downloaded here. Buy the full version of KnitBird. You will get a product key which you will use to activate the trial version. You can use this key to install KnitBird six times. To install KnitBird, you must ensure that Adobe AIR is installed. Download KnitBird enclosed in a ZIP file (knitbird.zip) or download the AIR Installation Package directly (knitbird.air). Run the Installation Package (KnitBird.air) and follow the instruction. Run KnitBird and activate it using the product key free.knitbird. Read more on system requirements for Adobe AIR. Adobe AIR Adobe AIR is a cross-platform runtime system which enables KnitBird to run on both Windows Mac computers. Development and support of KnitBird has ended. You can now download it for free. You are about to buy the full version of KnitBird. After your purchase you will get a product key which you will use to activate the trial version. You can use this key to install KnitBird six times. We are curious and would appreciate if you could participate in this simple survey.